A photograph entitled “Tlingit men named Billy Andrews and Charles Brown with carved figure, Saxman, Alaska, 1939” is in the University of Washington Libraries digital collection, negative no. NA3808, Viola Garfield Collection no. 130. Friday was a wonderful opportunity to visit the redesigned State Museum, or SLAM (State Library, Archives and Museum) in downtown Juneau. As I moved through the first floor of collections, it was dramatically different from the old museum I remembered. I enjoyed the groupings and spent much of my time in the front section focusing on the Alaska Native cultures. 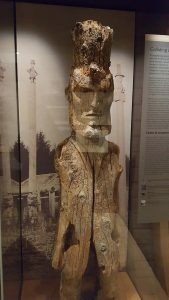 As I made the conscious decision to try to make it through the rest of the museum I came across the remnants of the “Lincoln Pole”, which is the object I chose to focus on for this blog. I was drawn to this object because of a recent family vacation where we ended up on a tour of Saxman, where there is a totem park with a replica of the “Lincoln Pole”. I have included a picture of it from our trip, and though we were too busy socializing with local elders to hear our tour guides information on the pole, we were able to overhear another guides version of the pole’s story or history. In essence it was a pole to memorialize or thank the US government for their support via military forces, which helped the Ravens who were warring with the Eagles. I’m sure each tour guide probably gives a different story in typical ‘white knight’ fashion to appease visiting tourists. The story we heard and the totem pole we were looking at just didn’t seem to sit right with my husband or I so this specific pole as been lingering in my thoughts since then. I personally had no idea part of the original pole was in the State Museum, despite my numerous visits it must have been overlooked. 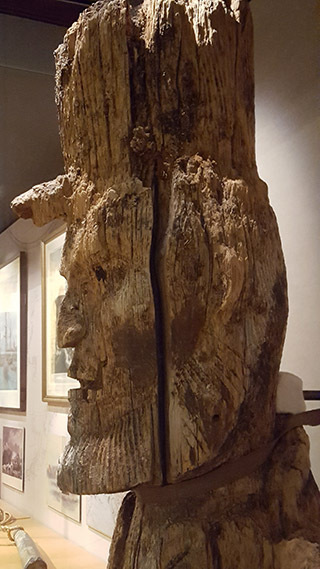 The museum was transferred this portion of the pole from the US Forest Service in the late 1930’s back when this was a federally run museum – The Territorial Museum. 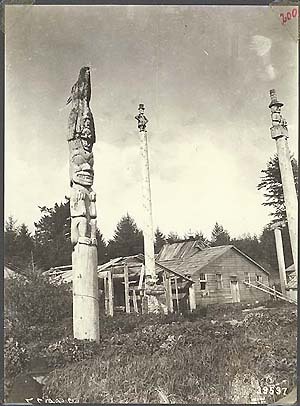 The US Forest Service transferred it during the 1930’s when they were working on Totem Pole restorations through the CCC during the New Deal Era – more of this information can be found in the video link below. I understand that the museum is still in its opening stages, so the markers identifying this specific piece were missing. I wanted to know a lot more about it and the wonderful people working at the museum went above and beyond to help me gather more information on it. I’ve included that research below if anyone is interested in more information. A quick search on the database upstairs lead me to an informative index card: Alaska 1978.0008VF – from the Alaskan Collectors Club. Upstairs at the museum I was also guided to a 15-page article by William Paul Sr. about the history of the pole and his investigation into the fabricated story created by Judge James Wickersham. I don’t have the rights to republish the article here, nor would I do justice to William Paul’s words with a summary, so I highly recommend checking out his article that does an amazing job of deconstructing Wickersham’s story, it also includes pictures of the original pole standing in its original location and a lot of cultural and historical background information. Paul, William L. Sr (1971). The Real Story of the Lincoln Totem. The Alaska Journal, 1(3), pp. 2-16. Finally, I was pointed in the direction of Emily Moore, PhD. She received her PhD from the University of California, Berkeley and was a visiting scholar at Sealaska Heritage Institute in 2011. She researched the restoration and creation of Totem parks in Southeast Alaska in the 1930’s and 40’s by the Civilian Conservation Corps. created in the New Deal era. This is a 45 minute video, and provides information into the historical background of the totem pole restorations and the coordination between Tlingit and Haida tribes and the federal government. I always appreciate what Sealaska Heritage Institute does with their visiting scholars program and lunch time lectures, so I’m including a link to their website as well.